The best picture I have of these flags is the photo in Kuhn 1991, p. 18. But even there you cannot see much  flags are flying, and the more interesting ones are not clearly visible. However (...) Mecklenburg-West Pomerania can be seen quite clearly: the old Mecklenburg flag (blue-yellow-red horizontal tricolour) with the old Mecklenburg arms (black oxhead on yellow). The source for my image is a photo (scan here) in Horizont (a weekly magazine for politics and economy), no. 40/1990, VEB Verlag für die Wirtschaft, Berlin (East), 1990. The flags of Thuringia, Mecklenburg-West Pomerania, and Schleswig-Holstein are in the foreground. 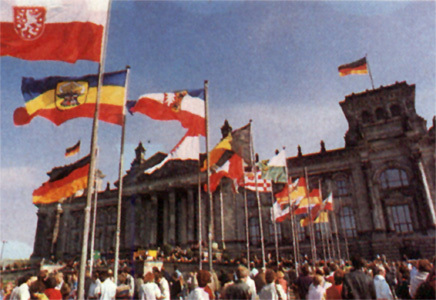 All these flags were hoisted before the Reichstag on 3rd October 1990 as provisional flags for the celebration of the first German Unity Day.